The brain, unlike the von Neumann processors found in conventional computers, is very power efficient, extremely effective at certain computing tasks, and highly adaptable to novel situations and environments. Artificial Neural Networks(ANNWs), an area of research that has recently received an explosion of interest, are algorithms that mimic the signal processing architecture of the brain. These methods have dramatically improved the state-of-the-art in speech recognition, visual object recognition, object detection, and many other scientific domains such as drug discovery and genomics. Now, both the quantity and also the size of data files are growing at a rapid speed, therefore computing speed and the power efficiency is the key on evaluating the performance of any machine learning algorithm. With the recent advances in quantum optical devices and on-chip nanophotonic circuit fabrication, we reasoned it is possible to design a viable on-chip optical neural network (ONNW) architecture. 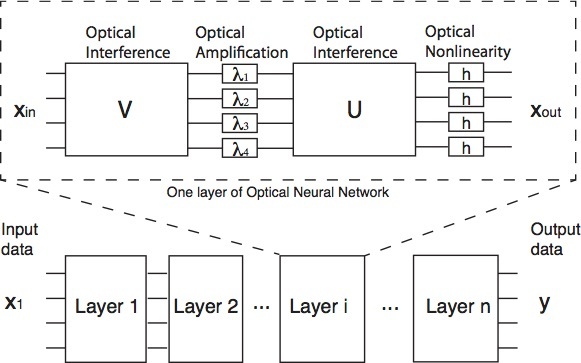 In this work, we will propose that conventional neural networks architecture can be entirely and equivalently represented by on-chip optical components.